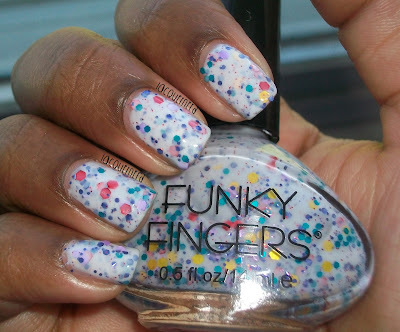 Day 17 is glitter and I have a swatch of Funky Fingers Jawbreaker for you today. I got this polish as a early birthday gift from my girlfriend, but Funky Fingers nail polish can be purchased at Five Below. This polish costs $3, and is a part of their 3 polishes for $5 special that they usually have. 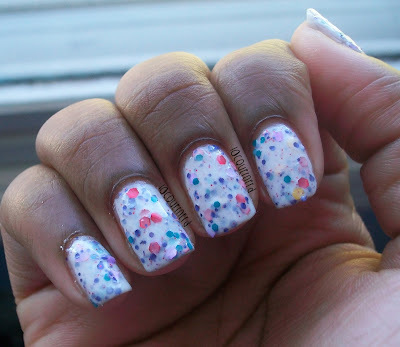 Jawbreaker is a mix of different sized multi-colored glitters in a milky white base. This is three coats with a top coat, but two coats would have been better. From what I can see, there's red, teal, yellow, blue, and purple glitters in the polish. There's a good variety of glitters in this polish. The application was very good. I didn't really have to do the dabbing method with this polish. Also, the drying time between coats is very fast, which is one of the things that I like most about this polish. Another thing that I like is that it's basically a jelly sandwich in a bottle! I guess it's the lazy way to a jelly sandwich, but that's okay to me. Overall, I'm really liking this polish and it's a great deal for the price of it! I don't know how much I will be using it because it's so much glitter and could be a pain to take off, but I can see myself going to this polish when I want a quick glitter fix. What do you think of this polish? Tomorrow is half moons! It looks beautiful! 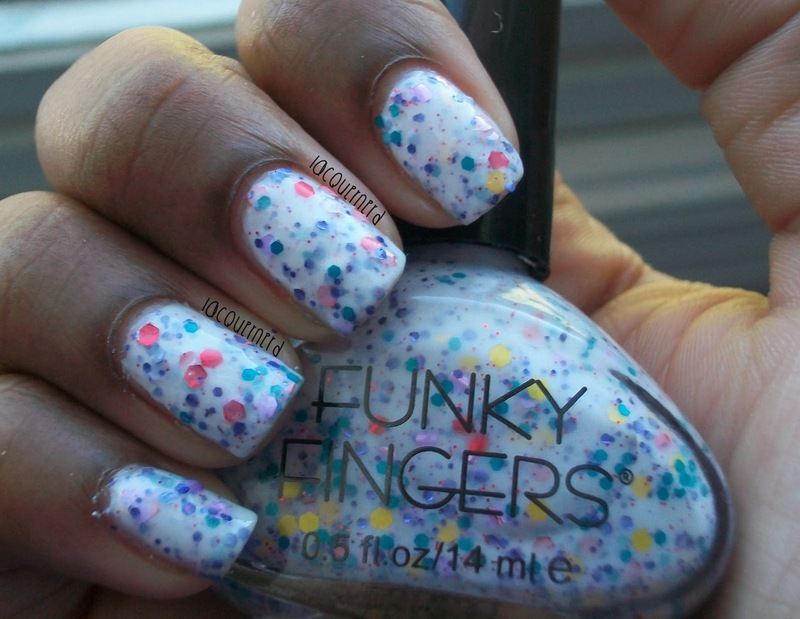 It reminds me of Dippin Dots :) I love the Funky Fingers brand, too -- it's such a great deal and they have so many unique polishes! I like Funky Fingers too. Oh yea, I see how it reminds you of those. now I want Dippin Dots lol. I have some crackle and a solar one as well. I need to get more the next time I go over there ^^.